Address 212 S. Main St. Description Hutchinson artist, educator and activist Debra C. Ringler returns to the Red Barn Studio Museum, 212 S. Main St., Lindsborg, June 11 to June 18. 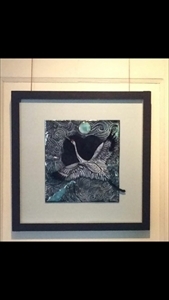 During her residence, visitors will find her working in a concentration of traditional and nontraditional enameling. She will continue to develop Lester Raymer inspired imagery of roosters, eggs and nests. Her intuitive collaging of multi-mediums creates exquisite sculptures that will inspire and intrigue. Debra Ringler is a multi-dimensional artist traditionally trained in sculpture with a concentration in ceramics. Ringler’s explorations have also lead to training in glass, enameling and metalsmithing. Her work has been exhibited in national and regional competitions for over twenty years. Her dynamic explorations in a variety of mediums also have been shown in solo exhibits throughout the region. Debra Ringler currently works and maintains a studio in Hutchinson, Kansas. Ringler has taught three dimensional design in ceramics, glass and metalsmithing consistently for over twenty-five years. The Red Barn Studio is open Tuesday through Friday 10AM to 5PM and Saturday and Sunday 1PM to 5PM. For more information, contact the Red Barn Studio at raymer@redbarnstudio.org and phone 785 227-2217. Add Debra Ringler to your free online travel itinerary.